June 26, 2018 – The Supreme Court has upheld the Trump administration’s third “Muslim Ban” in a 5-4 ruling on the case of Trump v. Hawaii, which challenges the ban’s constitutionality. The case questions whether or not Trump’s proclamation restricting travel and immigration to the United States from certain countries violates the Establishment Clause, which prohibits the government from making any law “respecting an establishment of religion.” While Trump claims that his three-time revised executive order (EO-3) concerning the Muslim ban is a lawful exercise of the executive’s broad power to “suspend or restrict entry of aliens abroad,” pointing out that there have been similar orders issued in the past, the Hawaii ruling responds that EO-3 “gives the President a narrow power to exclude aliens who share a characteristic that threatens the United States’ interests” and “public statements from the President and members of his administration are sufficient to convince the reasonable observer that EO-3 was designed to bar Muslims from the United States.” As it stands, the current version of the ban indefinitely suspends the issuance of immigrant and non-immigrant visas to applicants from Libya, Iran, Somalia, Syria and Yemen — all Muslim-majority countries — along with North Korea and Venezuela. Here is a round-up of responses from a variety of news sources and organizations, compiled by the Middle East Policy Council interns. Although the Supreme Court decided to repudiate the infamous Korematsu decision, director of the ACLU’s Immigrants’ Rights Project Omar Jadwat argued that “this ruling will go down in history as one of the Supreme Court’s great failures. It repeats the mistakes of Korematsu decision upholding Japanese-American imprisonment and swallows wholesale government lawyers’ flimsy national security excuse for the bank instead of taking seriously the president’s own explanation for his action.” According to the Arab American Institute, “This policy is not rationally related to national security interests and will continue to tear families apart while undermining America’s standing in the world. With this ruling, the majority has given a blank check to President Trump and future presidents to discriminate simply by claiming national security justifications. Today we need Congress, as a coequal branch of government, to act to affirm the equal dignity of all, regardless of religion or national origin.” Arab America reports that in an opinion written by Chief Justice John Roberts, the Supreme Court states that the travel ban was “not motivated by religious bias,” but based off of their opinion that indefinitely banning people from particular countries was a “lawful use of the president’s power under the Immigration and Nationality Act,” and that if the government feels as though the entry of any immigrants would be “detrimental to the interests of the United States,” then it would be deemed as lawful. In a dissenting opinion, Justice Sonia Sotomayor said the court is wrong to ignore Trump’s many comments and that simply setting aside such comments about Muslims, makes them seem irrelevant. Former Washington Post correspondent in Tehran, Jason Rezaian, explains that the Supreme Court’s decision is not just discriminatory, it also hurts the prospects for democracy in Iran, as it reminds Iranians everywhere that they have no allies — neither in their home country’s government nor in that of the United States, and that the ruling ironically plays into the hands of the clerical regime that still runs the country. According to Chris Boian, a spokesman for the U.N. refugee agency in the U.S., “Refugees will still be admitted under the vigorous vetting requirements,” including from the countries affected by the travel ban. However, a backlog of cases has built up as the Trump administration worked its way through several versions of the ban, as the original ban barred Syrian refugees from the U.S. until further notice followed by a revised ban suspending the entire refugee program for four months to allow for a security review. Trump also reduced the maximum global number of refugees the U.S. is willing to absorb in 2017 from 110,000 to 50,000. Coupled with the backlog, the lower ceiling on refugee admissions further reduces the chances of refugees in the midst of asylum applications from ever reaching the U.S. In Chicago, Lina Sergie Attar of the Karam Foundation, a nonprofit organization that helps Syrians, told NBC News that the Syrian refugees the group has been resettling are terrified. “We have to explain to them that we’re living in a time when the government that’s ruling America right now is not a very welcoming government,” she said. “It’s very painful for me as an American to have to explain this. I am the daughter of Syrian immigrants.” Attar added the travel ban won’t affect the group’s workload as only 11 Syrian refugees have been accepted in the U.S. this year, but it dashed the hopes of Syrians already in America of one day reuniting with family members still trapped in Syria or struggling to survive in refugee camps in Turkey and elsewhere, and leaves dozens of Syrian students who have already been accepted at U.S. universities in limbo. How has the decision affected your community? Your school? How might this decision affect American foreign relations? 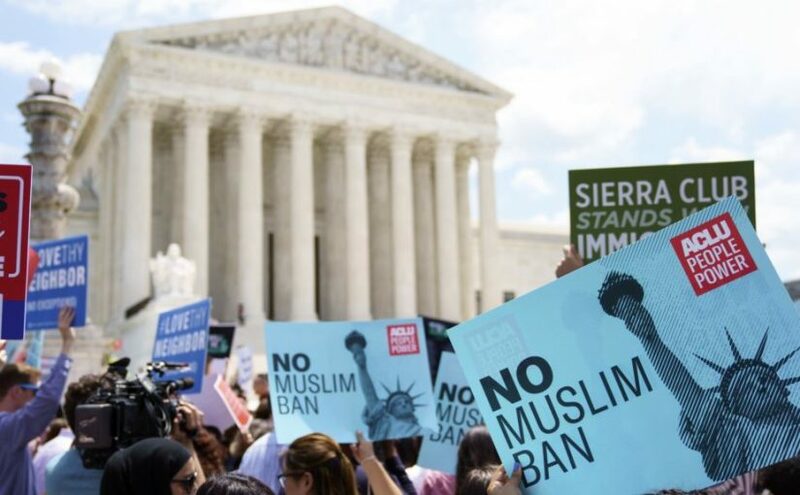 In its decision, the court said the ban was not motivated by religious bias but dissenting justices argued that Trump’s negative comments on Muslims should be considered. What do you think is the correct approach? The upheld travel ban indefinitely suspends the issuance of immigrant and non-immigrant visas to applicants from the Muslim-majority countries Libya, Iran, Somalia, Syria and Yemen — plus North Korea and Venezuela. Why do you think these particular countries are included in the ban? For more information on the details of the Executive Order, read Trump’s Travel Ban: How It Works and Who Is Affected.